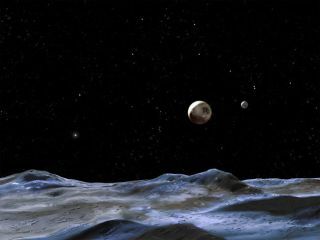 The artist's concept gives a view of the Pluto system from the surface of Nix or Hydra, two of its moons discovered in 2005. Nix and Hydra are two to three times farther from Pluto than its large moon, Charon (to the right of Pluto), which was discovered in 1978. Topastronomers and other planetary scientists will step into the ring this month toduke it out over a basic, yet controversial, question: What is a planet? "TheGreat Planet Debate: Science as Process" conference will be held from Aug.14-16 at the Johns Hopkins University Applied Physics Laboratory (APL) in Laurel, Md. Many planetscientists were disgruntled over the 2006IAU decision, which they said involved a vote of just 424 astronomers outof some 10,000 professional astronomers around the globe. The most recentdecision, to categorize Pluto and such as plutoids, furtherticked off many astronomers, who felt the term was developed behind closeddoors. "We'regoing to do something that the IAU did not, which is discuss what we know aboutplanetary bodies in the solar system and around other stars, and discuss thevalue of different ways of defining objects as planets and what thatmeans," said Mark V. Sykes, director of the Planetary Science Institute inTucson, Ariz. When thedust settles, those involved hope a consensus will stand, a classificationscheme for all objects orbiting a star. "If anew consensus emerges it will easily overturn the IAU. This is not anissue," said Neil deGrasse Tyson, director of the American Museum of Natural History's Hayden Planetarium in New York. "If not, they'll stick withwhat they've got until something better comes along." Tyson saidhe doesn't see the IAU so much as a separate entity, but as part of and areflection of the astronomical community. The planet definition saga began, arguably, when Pluto was discovered in 1930,as this object was an oddball compared with its solar system buddies in itseccentric orbit and small size and low mass (less massive than Earth's moon). The 2004discovery of Sedna,an object about three-fourths Pluto's size and about three times as far fromthe sun, raised some questions about Pluto's planetary status. Then, in 2005,Caltech's Mike Brown announced the discovery of 2003 UB313, and bells rang outof a possible10th planet in our solar system. The object was round, orbited the sun, andthe kicker ? it turned out to be larger than our then ninth planet, Pluto.Uh-oh. Since then,the IAU has labeled Pluto a "dwarf planet" and then later, a"plutoid." But some planetary scientists called foul on the way theIAU voted in the new planet definition or the outcome. In fact some vowed to callPluto a planet despite the most recent IAU ruling. And so inaddition to scientific sessions, the APL conference will include a Pluto debatebetween Sykes and Tyson. The debate, Tyson says, will focus on Pluto withregard to the mountain of new information being collected about our solarsystem and others. "I'mtired," Tyson said. "I've been arguing Pluto for eight years, so it'sanother occasion where I'm arguing Pluto. This one happens to be a little moreformal in its construct. So I see it as another day of just trying to tellpeople, teach people about, what we now know about the solar system." Sykesthinks an object should be considered a planet if it's round and orbits a star,which is a definition based on physical features of an object, such as its sizeand mass. Objects become round when they are so massive that gravity crushesthem into this shape, which is in hydrostatic equilibrium (a state where gravitional and internal pressures are in balance). His definition wouldusher in not just Pluto, but also Ceres (an object in the asteroid belt) andEris (the current name for 2003 UB313), as solar system planets. Based onwhat has worked in the past for planetary scientists, Tyson supports the ideaof using "observational features" to put an object on or off theplanet list. Such criteria would include distance from its host star, but itwouldn't include what the planet is made out of. Particularly with planet-likeobjects discovered outside of the solar system, astronomers can't eke out, say,whether the core is made of iron or another chemical, or whether its surface isrocky or not. It is hardto know what will transpire at the conference with so many top thinkers, Tysonsaid. "Whenyou bring a lot of creative, talented people together new solutions can arisethat might not have arisen from any one individual," he told SPACE.com. "The collaboration, the intersection of ideas, has its own way of creatingnew understanding." Sykes andothers organizing the conference say the most important aspect of theconference is, well, the conference itself. "Thistopic provides the perfect opportunity to teach science as a process, not acollection of facts," said conference organizer Keith Noll of the SpaceTelescope Science Institute in Baltimore. "We also need to stress theimportance of incorporating new discoveries to continually improve ourunderstanding of the diverse objects within planetary systems." Hal Weaver,a conference organizer and planetary astronomer at APL said, "No voteswill be taken at this conference to put specific objects in or out of thefamily of planets." He added, "But we will have advocates of the IAUdefinition and proponents of alternative definitions presenting theircases." At the endof the day, though, scientists are looking to come up with some sort ofconsensus on the topic of what it means to be aplanet. "There'sa lot of emotion, still a lot of room for opinion," Tyson said, "butit's conferences like this that are hoping to settle the dust and see whatremains standing and see if a consensus can emerge." If asensible classification system does emerge, Tyson said, it will spreadthroughout the astronomical community. Thebest-case scenario in Tyson's view: "Everyone sings 'Kumbaya' at the endwith a brand new classification scheme for everything that orbits a star. Thatwould be really cool." Hisworst-case scenario: "Worst case is that people throw tomatoes at eachother. There's been some fascinating emotion that has arisen over the pasteight years. And I'd be interested to see at what level they express themselves at this conference."